As I mentioned yesterday, I tend to avoid getting medical attention for myself. It isn’t a macho “I don’t need no stinkin’ doctors” kind of thing. Instead, it’s more of a “I need to do all this stuff for everyone else, how can I take time out to see the doctor/take medicine?” Sometimes it’s also a “We have so many expenses, how can I spend more money at the doctor’s for me?” thing. If it’s something serious like antibiotics, I’ll take my medicine on time and if I have a fever, I have no problem going to the doctor. It’s the little things (insect bites, allergies, nose bleeds) that I avoid seeing a doctor about or taking medicine for. 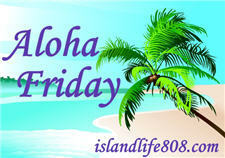 My Aloha Friday question for today is: Do you avoid seeing the doctor or taking medicine because you are too busy doing things for other people or to try to save money? Too busy taking care of others! Deborah recently posted..Blogorama Bonanza 11 Is Here! Yes, and my husband does too. Especially with our insurance only covering well visits, we’re not going for other appointments (dermatologist, etc) because we don’t want to pay for them. I’m also bad at finding the time for me to go. Guilty especially for myself I take my kids at the drop of a hat but put of going myself. I do hate to go to the doctor unless I’m really feeling miserable. But, once I go, I follow doctors orders and take all my medicine. Yep. Plus, I’m a nurse so I can usually take care of it myself. I’m so bad at remembering to take medicines . . . or even vitamins for that matter. My husband has to literally interrupt me while I’m on the computer and put the pills and water directly into my hand. Otherwise, it’s never going to happen. If I can take care of it myself I will, but no objection to seeing a doctor for something more serious.